The emission from a femtosecond Ti:sapphire laser can be used to create miniature structures made of protein that fence in a living bacterium. Fabricating structures in this way could someday be used to engineer neuronal networks for prosthetics or in other applications because the method is biofriendly and can be performed in the presence of living cells. Although the structures are small and inexpensive, a femtosecond Ti:sapphire laser costs upward of $100,000 and isn’t the type of system found in all laboratories. That situation has hindered research into and application of these protein microstructures. But researchers at the University of Texas in Austin, including Jason B. Shear, have experimented with a less expensive alternative for this application. 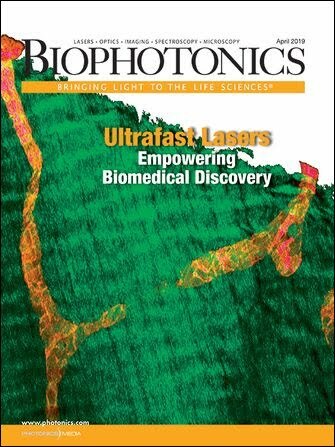 They have shown that similar results are possible with an Nd:YAG laser that costs roughly $6000, which could make 3-D protein manufacturing achievable with the kind of laser found in many facilities. Microfabrication of protein structures using an Nd:YAG laser doesn’t affect functionality. Researchers created two spirals (a), one of avidin (upper left) and the other of bovine serum albumin (upper right). Fluorescein biotin bound to the avidin structure (fluorescence image, lower left) but not the BSA one (fluorescein image, lower right), the same result that would be obtained without microfabrication. The image in b shows a fluorescence intensity plot of the avidin structure. Scale bar is 5 μm. The key to the fabrication process, no matter the light source, is multiphoton excitation of either a photosensitizer or the protein. That photon absorption leads to protein cross-linking and, because the excitation is a highly nonlinear process, the photochemistry initiated by the laser can be confined to a small volume. Focusing the laser down to a submicron spot enables a photochemical volume of less than a cubic micron. By moving that spot in a controlled fashion, scientists can create protein matrices in three dimensions with features of a few hundred nanometers to several millimeters. However, the technique requires high peak laser intensity, on the order of hundreds of billions of watts per square centimeter. In a series of experiments, the researchers set out to see if a relatively inexpensive and small Q-switched frequency-doubled Nd:YAG laser at 532 nm could generate the right conditions. Such lasers produce pulses of less than a nanosecond duration with energies of several microjoules. Their peak power is comparable to that needed to cross-link proteins. What’s more, Shear noted, previous studies have indicated that substituting this type of laser for the other could be successful. “In most cases, the Nd:YAG does work approximately as well as the Ti:sapphire laser,” he said. As detailed in the March 24 online issue of Analytical Chemistry, the researchers used a laser from JDSU of San Jose, Calif., operating at less than 1 mW of average power with a pulse width of about 600 ps. They adjusted the beam to fill the objective of a Zeiss microscope and used optics with a numerical aperture of 1.3 and oil immersion to deliver the beam where needed. They employed a motorized stage for movement in the X and Y directions, while changing focus to move the cross-linking point along the Z-axis. They compared the results obtained with the Nd:YAG laser with those from a femtosecond Ti:sapphire laser operating at 740 nm. For their structure’s base material, they used a solution of bovine serum albumin (BSA), adding the dye Rose Bengal, in some cases, as a photosensitizer. They also used the glycoprotein avidin, which has a strong affinity for biotin, as a raw material. Previous work had shown that avidin structures retained their biochemical characteristics, and to confirm that this was the case when using a Nd:YAG laser, the investigators labeled biotin with fluorescein, allowing them to use fluorescence microscopy to validate that the avidin was still functioning. In a series of studies, they compared structures fabricated with the two lasers. Scanning electron microscope examination showed similar structural integrity and gross features for both sets of formations. There were some small-scale differences; for instance, features produced by the Ti:sapphire laser were smoother in appearance. As was the case with earlier Ti:sapphire fabrication research, the investigators could build a protein fence around a cultured rat neuron. Corralling the neuron is an important initial step toward the more sophisticated manipulation needed to build a neuronal network. They also showed that avidin structures retained the ability to bind to biotin by constructing a microspiral, exposing it to fluorescein labeled biotin and imaging it. The picture faithfully reproduced the one captured by the scanning electron microscope. This series of images shows researchers corralling cells with an inexpensive laser and protein microfabrication. A rat neuron (a) has an outgrowth contained by a line created by cross-linking proteins in a solution of bovine serum albumin using an Nd:YAG laser at an average power of 1.5 mW. The wall is less than 1 μm high and doesn’t affect growth 10 minutes after fabrication (b). Despite its low profile, the wall successfully confines the outgrowth 26 (c) and 95 (d) minutes after fabrication. Scale bars are 5 μm. Images reprinted with permission of Analytical Chemistry. The researchers used the same microspiral structure to build a pH sensor by exploiting the fact that fluorescein has a larger quantum yield at higher pH values. It thus acts as a probe of the local chemical environment, which they measured by observing the fluorescence intensity under various pH conditions. As for other characteristics, they found that the width of the protein lines for the Nd:YAG laser was less than 0.5 μm at 1 mW and that it increased by about half when the power was doubled. By moving the beam fast enough to overcome random motion with a solution, they could even enclose free-floating particles in a protein box. The researchers are concentrating on applying the fabrication of microstructures to various tasks. Shear said that, in principle, an even less expensive laser than the Nd:YAG could be used, provided that it met certain criteria. “It would likely need to produce similar peak powers and beam quality and have a reasonable repetition rate — that is, kilohertz or higher,” he said. Contact: Jason B. Shear, University of Texas, Austin; e-mail: jshear@mail.utexas.edu.